I am delighted to have been invited to be part of the forthcoming Ethel Mairet Masterclass at Ditchling Museum of Art & Craft, organised in conjunction with Selvedge magazine. This 5-day course runs from April 3rd to April 7th 2017 and will give students an opportunity to experience working in the stimulating environment of the museum and to immerse themselves in the world of Ethel Mairet, in the charming village where she lived and worked. More details are available on the Selvedge and Ditchling Museum websites. I shall be leading the natural dyeing component, which will give students the chance to follow some of Ethel Mairet’s recipes, as presented in her book “Vegetable Dyes”. There will also be an opportunity to study and compare the different editions of this classic work. I was thrilled to find that one copy of the book even has Ethel Mairet’s own handwritten pencil notes on some of its pages and this really breathes life into her recipes. Ethel Mairet’s importance lies particularly in her inspiration as a teacher and educator. In “Vegetable Dyes” she follows in the tradition of earlier professional dyers, imparting knowledge & sharing experiences in order to encourage dyers to aim for the highest standards in their work. 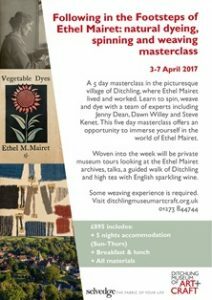 Her comments give an insight into the working methods of the professional dyer in the early 20th century and on the course we will consider how Ethel Mairet’s work can inspire today’s natural dyers to improve their own practices. Although “Vegetable Dyes” covers very many sources of dye colour, in fact Ethel Mairet herself used mainly the classic dyes, madder, weld, cochineal and indigo and these are the dyes we will be using on the course; they remain the most reliable dyes for use today and those which I recommend to dyers who wish to be sure of consistently good results. They are also dyes from which a wide range of shades and tones can be achieved and this is something we will be exploring on the course. Although some of the recipes in the dye book require the use of chemicals which are no longer recommended for use today, many recipes are still relevant and useful. These are the ones we will be following to dye both wool and silk skeins and while some recipes may appear rather complicated, many are brief and relatively straightforward – at least they are when one has managed to adapt the quantities for smaller weights of fibres. The two recipes below are typical examples. Work the cotton for ¼ hour with 2 pints catechu (1 lb catechu to 7 or 8 gallons water; boil and add 2 oz copper sulphate) in hot water, lift and add 2ozs copperas in solution. Work for ¼ hour and wash. Add 2 oz logwood to a bath of warm water & work cotton in this for 10 minutes. Lift and add ½ oz alum. Work 10 minutes; wring out and dry. (For 60 lbs wool). 5lbs 12 oz alum. Boil and immerse wool for 50 minutes. Then add 1 lb Cochineal and 5 lbs cream of tartar. Boil and enter wool while boiling, till the required colour is got. 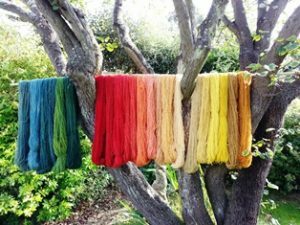 Students on the masterclass will also have an opportunity to see and study in detail the wonderful and ever-increasing array of colourful dyed skeins, which form part of the current Ethel Mairet exhibition. These have been dyed especially for this event by dyers from many parts of the world, following recipes in the 1916 edition of “Vegetable Dyes”, and each skein is accompanied by a description of how and by whom it was dyed. 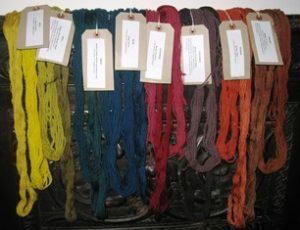 This collection of dyed skeins is a unique example of collaborative work from natural dyers who live and work in many different countries and cultures and it will remain a lasting tribute to a remarkable weaver and dyer, who spent most of her working life in the village of Ditchling but whose influence was far-reaching. I am sure students will share my love of Ditchling Museum and I am really looking forward to leading a masterclass in such a very special venue.